Sorry about the lack of post yesterday -- an early morning NAIBA board meeting. I'll have my run-down on the results of that meeting, and this month's ABA Digital Task Force, in tomorrow's post. This is the second installation in the series I began last week, describing my vision for the bookstore I'd like to own in Brooklyn. I welcome your (constructive) criticism, praise, or additional ideas. Next week's installation will talk about sidelines, extra services, and behind-the-scenes stuff; this week is about the bar. Around the corner, down the stairs, or next door to the bookstore, depending on the space, is the bar and café. The color scheme of the bookstore is maintained here, in slightly more intense shades, but the space is separate and can be entered without passing through the bookstore, though it is also accessible from the store. (Anti-theft gates at the street entrances of both the bar and the bookstore prevent theft of books through either exit, and signs inform customers that they will be asked to pay for any books that they may accidentally damage in the bar.) At a wooden bar, a barista serves coffee, tea, espresso drinks, and juices during the day; after 5:00, a variety of wines (and perhaps beers) are served by the glass or bottle. The baristas can make recommendations for wines from a rotating selection, with several standbys and new wines each month from a local wine shop partner. Sandwiches and snacks from local providers may be added later. All food and drink selections will emphasize local Brooklyn brands, fair trade, and natural ingredients wherever possible. The cafe will build on the excellent model of Vox Pop, but without minimizing the space for books. A large table and several small tables, made of wood and metal, offer places for customers to sit and drink, read, or work. Free wi-fi is available throughout the cafe (the network password is provided with a food or drink purchase, as at McNally Robinson), and printing services are available for a fee. A bookcase of overstock or damaged books is available for reading in the café, each with a label with the bookstore's logo and "bar book" imprinted on it. The majority of the bookstore and café staff are interchangeable, though they will only have one task in a given shift; thus the café staff is knowledgeable about the books, and the bookstore staff knows what's going on in the café. A café manager – ideally someone with a passion for wine and coffee equal to the bookstore owner's passion for books – handles ordering, staffing, and maintenance in the café bar. At the back of the bar/café area is a small stage, large enough for an author conversation or a small band (e.g. the stage in the Old First Fellowship Hall). The area in front of this space is left largely empty, except for a rolling table with books for upcoming events and tables along the sides. (Or, perhaps, rolling bookshelves with event books and sidelines which can be pushed to the wall for events.) On the stage is a sandwich board printed with "Tonight", and the evening's scheduled event chalked or posted below it. In the evening, the rolling table is moved to the side, and folding chairs fill the empty area. Those sitting at tables are able to hear the event if they wish, but they are not at the front and center of the audience (e.g. Bowery Poetry Club) – the setup is almost cabaret-style. Drinks can still be served and the business of the bookstore conducted during events. Events are held nearly every night of the week, and range from readings by major authors, to discussions of local issues, to first-time and self-published author nights, to celebrations of holidays and festivals (the publication date of Leaves of Grass! the anniversary of the Battle of Brooklyn! ), to bands and other performers, with various ongoing series and lots of input from staff and customers. Whether it is a reading, panel discussion, conversation, musical performance, or other kind of event, each evening is sound-recorded and later added as a podcast to the bookstore website. Podcasts may eventually be collected on a CD for purchase. Event books are discounted for the day of the event only, and customers can ring up their purchases either at the bar or in the bookstore. Classes may be held in the event space during the day, and it will be available to rent for special occasions. Okay, so I didn't post on Friday. Aside from domestic distractions, you might have heard of this little book that was about to be released at the stroke of midnight? The McNally Robinson Harry Party for Grownups wasn't by any means the biggest or the craziest party happening on Friday night in bookstores, but it had its share of big craziness. Read about how it turned out here in the Times ("swilling?!? "), here on the Obsolete Vernacular blog (scroll to the end - "classy" we like), here on NYT ArtsBeat ("stylish" is good too), and here on GalleyCat ("explosive" is even better). I'm sure there are more mentions out there -- would love to see them if you send the links. At the risk of giving away store secrets, I think it's safe to say we had no idea how big this event would be. The HP for Grownups party two years ago when Book 6 came out was festive, but manageable, and we sold about half our stock on the night and more throughout the week. Whether it's because the bookstore is so much more well-known after two and a half years of business, or whether it's a result of everyone wanting to get in on what feels like a historical moment -- the end of the Harry Potter era, the last hurrah -- the crowd and the sales exceeded all expectations. We had lines for the fortune tellers, the tarot card readers, the costume contest, the sweepstakes entries, and of course the booze. We had a line in front of the veiled book boxes (decorated with chains and a sign reading "Azkaban") that was more like a mob. We had lines outside the door that stretched around the corner and nearly to Spring Street, a long city block away. I was at times reminded why I don't tend to go to trendy bars or clubs anymore -- the claustrophobia of that many people, even joyful ones, crammed into a space was intense. There were some murmurs about crowd control, and we had the usual worries about theft and running out of things like sweepstakes entries and toilet paper. But I think all of us booksellers were happily amazed at the good will and good behavior of all those stylish 20-somethings. There's something about this party -- acting like a kid, immersing yourself in another world, discussing the battles of good and evil, dressing up in costume, awaiting a moment as portentious and huge as Christmas morning, being surrounded by books -- that brings out the best in everyone. Aside from some mild pushing and shoving that couldn't be helped, everyone was thoughtful of their fellow fans. We heard nothing but appreciative comments about the magicians, mystics, and decorators who put the party together. And when we counted down to midnight (my favorite part, as I'm a bit of a ham with the microphone) and started passing out books, Sarah observed that it was kind of like playing Santa Claus. We felt lucky to be the conduit for all this joy, the link between book and reader. And I have to admit, I was a little jealous of those fans. I have somehow managed to avoid Harry Potter altogether -- never read any of the books, never saw any of the movies. The media ubiquity of the titles means that I know a few names and salient plot points, but perhaps due to my bookseller bestseller snobbery ("if everyone else is already reading it why should I? "), I've never ventured into the stories, despite my propensity toward good fantasy. And for the first time on Friday night, I wished I had read them, if only to share that sense of community that involvement in an imaginary place can give. I remember it a bit from when the Star Wars movies were re-released, or the Tolkien madness of Lord of the Rings. But this is a contemporary phenomenon, our own generation's set of myths, and there's something to be said for taking part in it, no matter how much is hype. As New York Magazine noted, years from now our grandchildren may ask us where we when the final Harry Potter book was published. I'm glad our bookstore could help to create that memory. Wednesday I'll be back with the second in the Dream Bookstore Series: the cafe! the sidelines! and more! Oh my friends, life is crazy -- sometimes I feel as though I'm paying some kind of karmic dues for the beautiful few weeks surrounding the wedding. You don't even want to know the details -- you've all had that kind of week. Anyway, here's just a few links to tide you over until things calm down. - You know who is opening a branch, though? Miami independent bookstore Books & Books (run by the supercool Mitchell Kaplan) is opening a new store -- in Grand Cayman. They're working with developers of a new urban center and hoping to bring author tours through as well. As Mitchell wryly notes, "I can’t imagine it will be too difficult to persuade visiting authors to schedule a stop" in the Caribbean. - Thanks for your feedback on my "ideal bookstore" post. I've responded to your thoughts in the comments. I'm a little more leery of putting my ideas out there, as it can be tough to take criticism of one's dreams. But much of what you've said is what I'm already thinking, and it forced me to clarify some things and think hard about others. Thanks -- you'll be hearing more out of me soon! After much dithering, I of course ended up taking along half a dozen books on the honeymoon -- far more than I could possibly have time to read in a week; but the ALP did the same, as this is apparently the packing curse of the book nerd. Here are the ones I did get to. Yeah, I know, not your typical narrative to review. But this is the one that's got the most signs of wear, and I probably read the whole thing cover to cover in various increments. Mostly we were interested in good restaurants (mmm, mofongos and mallorcas) and bars (mojitos of course), and a few historical sights (the 500-year old fort of El Morro, evocative of horrific barracks life as well as the occasional excitement of a pirate raid; and the well-preserved home of Dona Felisa, the beloved long-time major of San Juan, the first woman to be elected mayor of any Western city; and our own hotel, El Convento, which has its share of history from convent to flophouse to glamorous 1960s hotel life). My only complaint about Frommer's is that they failed entirely to mention the La Perla district, which shows up as a blank patch on the map of San Juan. The ALP and I curiously wandered outside the old city walls and into the district, which turned out to be not only the birthplace of reggaeton but the most notorious ghetto on the island. We managed to walk out on the other side none the worse for wear, but not without some serious culture shock. 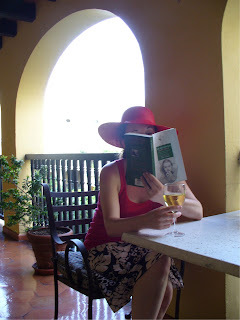 Now the ALP wants to write a noir mystery set in San Juan; you could do a lot worse. So many people recommended this as vacation reading that it seemed inevitable, and I was so glad they convinced me. From the blurb quote by Groucho Marx to the impassioned introduction by Terry Teachout, they were right all the way. It's the perfect intellectual/bohemian/romantic romp, and brought back intense memories of my own youth in study abroad programs in Europe (while making me glad I wasn't back there again). The heroine, Sally Jay Gorce (whose name I love) is an inveterate runner-away-from-home and has had the immense luck of being given an allowance to live in Paris for two years, and she is, as the back jacket puts it "hell-bent on living." An affair with a married Italian, involvement with an invigorating circle of pretentious bohemians, friendships and love affairs with artists, cottage stays in Biarritz, involvement with movie directors and bullfighters and pimps -- Gorce's whirlwind tour is a brilliant encapsulation of the invigorating novelty as well as the occasional tedium and sham that come with being young and unfettered in a foreign country. The comedy comes from both her own awkward stumbles and the pitch-perfect portraits of boorish and self-absorbed aristocrats, artists, and small-town Americans. The pathos comes from her unavoidable moral instinct, which realizes that there are casualties in such a headlong flight. I tried to describe the plot (involving misplaced affections, revenges, and secret crimes, as well as lots of heated conversations in French cafes) to the ALP, who pronounced that it sounded like chick lit. And it's true to some degree -- I won't really be spoiling it to tell you that Sally Jay finds true love at the end of her wanderings. But it all feels less premeditated and more spontaneous than that moniker would imply -- it has the momentum that real travel experiences do, where one thing leads surprisingly to another and you stay out all night and somehow it all seems symbolic and connected. Sally Jay connected with the bohemian traveler in me, and she made me laugh. I can't recommend this enough for exactly the purposes I used it for -- lighthearted summer enjoyment that won't compromise your intelligence, and might make you a bit wistful for your own wild youth, as well as grateful that you came out of it alive. This one was even purer escapism. I ate up Burdett's previous thrillers Bangkok 8 and Bangkok Tattoo, and couldn't wait to follow the further adventures of Detective Sonchai Jitpleecheep, the devout Buddhist, co-owner of a brothel, friends with a female FBI agent, only non-corrupt cop in the Thai police force but subject to the whims of his gangster boss Colonel Vikorn, who mentors a young katoey (transsexual) and includes plenty of aside to the farang (foreigner) reader, even as he struggles with the East/West split of his own American paternity. In the first book Sonchai solves a murder involving cobras, mourns the loss of his childhood friend and police partner Pichai, and helps set up his working-girl mom Nong with her own Bangkok brothel; in the second he solves a Japanese yakuza plot and married his longtime love Chanya, a worker in his mother's establishment. But in this one Sonchai, now expecting a child, is literally visited by a ghost from his past: Damrong, another prostitute who once held him in thrall, is murdered in a snuff film he receives from an anonymous source, and she begins once again to haunt him. I'm taking a breath and realizing that's way too many plots points to throw out, but I haven't even scratched the surface of this pell-mell ride. Burdett is a Brit, but he has immersed himself in the teeming life of Thailand's capital city (Bangkok is as much a character as any of the people in the story), and he writes with irresistible force and candor. Sonchai is an endearing character because his contradictions agonize him: he has a personal code of conduct but cannot judge others, and struggles to reconcile his Buddhism with the dog-eat-dog corruption that he totally accepts as the nature of reality in his country. In this book he has to deal with bribery, sexual enslavement, even sorcery, and he's pretty beat up by the end, but he makes a faithful and compelling narrator. I found this book darker than the previous two (and why did both of my vacation novels have prostitution as a subplot?? weird...), but told in the same discerning but compassionate voice. Highly recommended beach reading, but not for the squeamish -- probably much like Bangkok. The ALP (whom I will continue to refer to as such, since he's still my Adorably Literate Partner as well as my legally wedded spouse) and I have just returned from our honeymoon -- a blissfully lazy week of good food and drink, ocean air, and of course, reading. Here you see the Book Nerd in vacation mode, and one of the books that made the honeymoon cut. We had a totally sweet and wonderful wedding -- our family and friends pitched in with cakes and decorations, and we danced the night away in our little Brooklyn church hall. I'm just coming back to earth, and I feel like I'm way out of the loop on happenings in the book world. But here are a couple of exciting links I've managed to glean from my inbox, for at least a token Link-Mad Monday. *In case you haven't noticed, it's Harry Potter Season. Along with the latest movie installation already out, the final book in the series, Harry Potter and the Deathly Hallows, comes out at midnight on Friday, July 20. The New York Times has this article about Potter Parties, and the ABA reports on party plans for indie bookstores across the country. My own bookstore's twist is the Harry Potter Party for Grownups -- referring not to academic scholarship, as in the Toronto event, but to the availability of "magic punch" for those over 21 and a very grown-up DJ. Should be fun! * I'm so blown away by the genius of the new project of Larry Portzline, founder of the National Council on Bookstore Tourism: a 10-week tour scheduled for next April, visiting 200 bookstores in 10 weeks for a "Why Indie Bookstores Matter" tour! Publicity is already building, as you can see by the tour website, and Larry has some ingenious ideas for funding his "quixotic" project. More power to him -- can't wait to hear more about the tour as it develops, and hear about the great ideas about the importance of indies he picks up along the way. Way to go, Larry! * I'm probably the last to link to it, but Dan Wickett's Emerging Writers Network site has posted the sixth Litblogger E-Panel -- basically a joint interview with several litbloggers, yours truly included. Several of the bloggers I admire also sound off; it's pretty fascinating to get this multi-perspective look at who's blogging and why. BEA, take note for next year's litblogging panels! 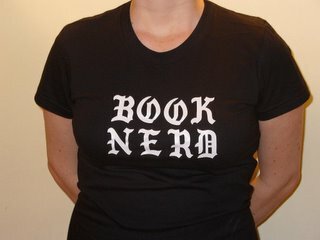 * Also interviewed this week: Megan Sullivan of Bookdwarf gives an interview to LitMinds. I have increasing respect for LitMinds interview series and online conversation boards, and it's always interesting to hear what Megan has to say. * And more cool literary kids in the news: the already much-linked NY Times article on hipster librarians has a front-and-center picture of Jessica Pigza, the totally cool wife of Sean Concannon, our sales rep from Parson Weems. My favorite line from the article: "How did such a nerdy profession become cool — aside from the fact that a certain amount of nerdiness is now cool?" Ha! I feel totally nerdy/cool by association. And more importantly, it's so encouraging to read about another group of young people unashamed about following their passion for books, community, and changing the world. * Now for a little preview of my preoccupations in the coming weeks and months. I am officially an entrant in the Brooklyn Business Library's Power Up! business plan competition. This awesome hometown project offers expert advice, classes, and the resources of the business library to aspiring entepreneurs hoping to start up small businesses in Brooklyn, and a $15,000 prize for the best business plan submitted by September 14. (One of my favorite -- and super successful! -- Brooklyn restaurants, Bogota, was the first winner.) I work best with a deadline, so I'll be gunning for that date to get all the mountains of information I've accumulated in working order for a viable plan for my Brooklyn independent bookstore. It's going to take up lots of time and mental space, so you may see more business-related content on the blog. I'll still review books and talk about what's going on in the industry as a whole, but I'll be focusing more on the process of preparing to open a bookstore. Hope you like reading about it. Wednesday I'll talk about the great books I read on vacation. In the meantime, anyone have a great summer read they'd like to share?